It is said that Jules Verne chose a Supergun for his story because he didn't think that anyone would believe that a rocket could actually take people to the Moon. For years gun propulsion was considered the only practical means of launching vehicles into space, as rockets were still relatively small and crude gunpowder-based devices. By the 1930's the first liquid propellant rockets began appearing and gun propulsion was soon abandoned as a means of space launching. The High Altitude Research Program (HARP) was unique in the history of the space age. For the first time in history a serious attempt was made to use cannons in place of rockets to explore earth's upper atmosphere and to try to launch satellites. The story of the HARP program is a long and interesting one that has already been detailed in several excellent books. This work is intended as only a brief history of the HARP Program that hopefully will allow the reader a deeper understanding of the personalities and events that affected the project. Unfortunately the scope of this work does not allow full credit to be given to each and every person that participated in HARP - only the major personalities can be covered. The origins of HARP can be found in the later half of the 1950's when several related gun propulsion projects were conducted in Canada and the USA. 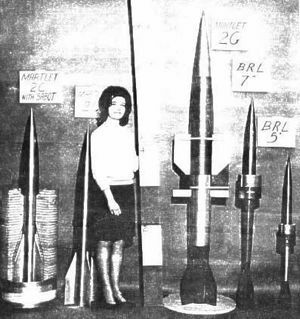 The two notable centers of research at the time were the Canadian Armaments and Research Development Establishment (CARDE), Aerophysics Wing, under Dr. Gerry Bull and the US Army's Ballistic Research Laboratory (BRL) in Aberdeen Maryland under Dr. Charles Murphy. At CARDE Bull worked on many aspects of aerodynamics and ballistics for both missile and gun propulsion systems. When no major government-authorized projects were in progress, Bull conducted many small projects related to ballistics and particularly high velocity guns. Although much of Bull's work revolved around military development he also worked on several different types of gun propulsion systems and on development of essential components (such as gun-launchable radio transmitters and electronics). It is interesting to note that at the time the US Army had posted several officers at CARDE not only to co-ordinate efforts with the Canadians, but also to keep a close watch on the unique work that Bull was doing there. Ironically Bull soon learned that although it was next to impossible to get money from his cash-strapped superiors for quick experiments, the US officers had their own budget and would fund most any worthwhile endeavor. 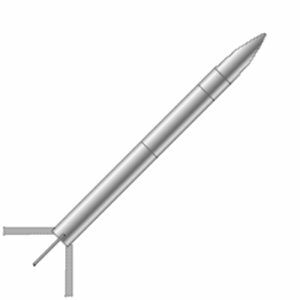 It was at CARDE that Bull developed his gun-launched satellite concept. He also gained an international reputation for his brilliant ballistics work. In the process made many friends within the US military establishment that would serve him well in the coming years. Concurrently the US Army's Ballistics Research Laboratory was also working on various gun propulsion systems. Of particular note were their efforts to develop a small gun-launchable high altitude atmospheric probe. In the 1950's there was a substantial need for an inexpensive alternative to rockets for gathering information on the upper regions of the atmosphere that the new jet planes were approaching. Early BRL experiments with dart-shaped vehicles capable of ejecting radar reflective chaff at high altitudes proved successful. This led to the development of the BRL 5-inch gun system capable of lofting a 26 lb. Sub-caliber gun probe to an altitude of 50 miles. This gun system was used extensively during HARP (300 flights) for atmospheric research and was the foundation for all future HARP gun systems. Bull and Murphy found that they shared many professional and personal traits and became fast friends. It was also during this time that Gerry Bull's political problems began. Mostly due to childhood insecurities, Bull had difficulty separating criticism of his professional work from personal attacks. He also had little patience for the ponderous bureaucracy above him, which he saw at best as wasteful and incompetent. This belief stemmed from the slow rate at which research proposals were handled by the bureaucracy and the inefficient manner in which they were finally implemented. Bull was both vocal and tactless in his criticism of his immediate superiors and the other government departments that he dealt with. He won few friends by calling many officials 'cocktail scientists', along with other, less polite, names. The animosity this generated would haunt Bull for years to come. To Bull's credit his opinion was shared by many others including Murphy who was 'amazed' at the 'incompetence' he found at CARDE at the time. By the early 1960's both the professional and the scientific elements for a project such as HARP were in place. All that was needed was a catalyst to get things started. In early 1961, after a decade at CARDE, Gerald Bull resigned his position in frustration. It did not take long for word to spread that Bull was now a freelance consultant. Many employment offers, particularly from the USA, came his way. But Bull, now with a wife and children, did not want to leave Canada. Over the past decade he had developed strong family and community ties and he was reluctant to leave the country. He was also convinced that Canada had the capability of becoming a great spacefaring nation and that his supergun concept would be the means. Early in the year Bull was approached by Donald Mordell, the Dean of Engineering at McGill University. As well as being a notable engineer in his own right, Mordell shared Bull's dream of a satellite gun. He wanted to join with Bull to make the dream a reality. On June 5, 1961, at the age of 34, Gerald Bull became the youngest professor ever appointed by McGill University. This provided Bull with employment and gun research opportunities while the details of the supergun project were worked out . The HARP odyssey had begun. Over the summer of 1961 Bull and Mordell drew up the plans for the HARP project and Mordell began to seek funding. The HARP plan was immediately turned down by Bull's opponents at the Canadian Defence Research Board. In August Mordell approached the Canadian Department of Defence Production (CDDP) for funding. Convinced the spin-offs from the HARP project would more then pay for their investment, the CDDP made a verbal promise for a grant of $500,000 with the understanding that it would take at least six months to work through the red tape. Eager to begin at once, Mordell and Bull approached McGill University's board of governors for a $200,000 advance to develop a gun range and set up initial operations. Based on the CDDP's assurances, and the pair's contagious enthusiasm, McGill agreed to the loan. The understanding was that they would be paid back in a few months when the government funding came in. All the pair needed now was launch site. Initially it was assumed that the HARP launch sites would be conveniently located in the wilds of northern Quebec near McGill, but Donald Mordell had another idea. 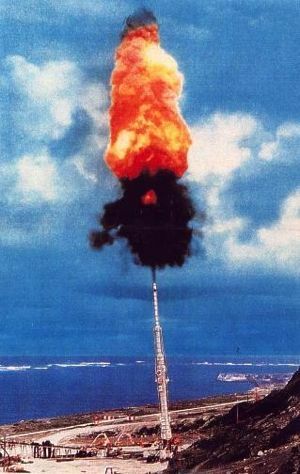 The ultimate goal of the HARP project was the development of a satellite launcher. Therefore a site close to the equator, to take advantage of the extra velocity imparted on a satellite launcher by the earth's rotation, would be far better. At the time McGill University was supporting two research stations on the island of Barbados. Donald Mordell had the notion that the island would make an excellent location for the high altitude flight range. In the early1960's Barbados was still a relatively impoverished nation. They were more then happy to host a project with the potential of HARP. At 13 degrees north of the equator, Barbados was an excellent site for satellite launches. 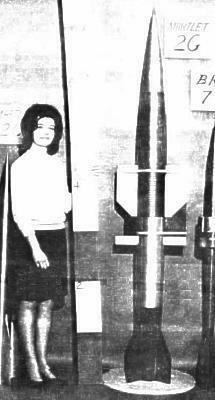 It also allowed for thousands of miles of downrange area over the Atlantic Ocean for the safe impact of projectiles. In October of 1961 Gerald Bull travelled down to Baltimore, Maryland, to visit his old friend Charles Murphy, then head of the U.S. Army's Ballistic Research Laboratory (BRL). Murphy, like Bull, was an old artilleryman. A project with the potential of HARP was a soft sell. Murphy was so eager to join, in fact, that within days he had located and acquired for the project the largest artillery piece in the American arsenal - a 16-inch battleship gun complete with a land mount and surplus powder charges. BLR also contributed a heavy-duty crane to move the gun and a $750,000-dollar radar tracking system. It was promised that all of these items would be delivered as soon as a launch site was finalized. The US Army's generous support was a much-needed boost for the HARP project. But their support was more then purely scientific. At the time the US Army was in a political battle with the US Air Force over control of the new domain of space. After all, an Army rocket launched the first US satellite after the rockets of other services had failed. The US Army was determined to capitalize on its successes. 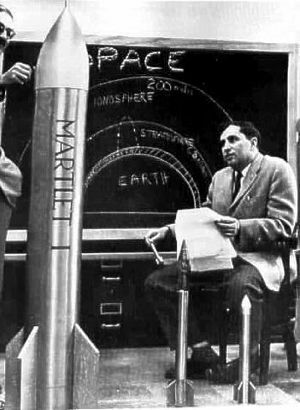 HARP was seen as a means of maintaining a hand in space defense research while publicly declaring that they were only contributing to a major research project that was studying long-range artillery ballistics. 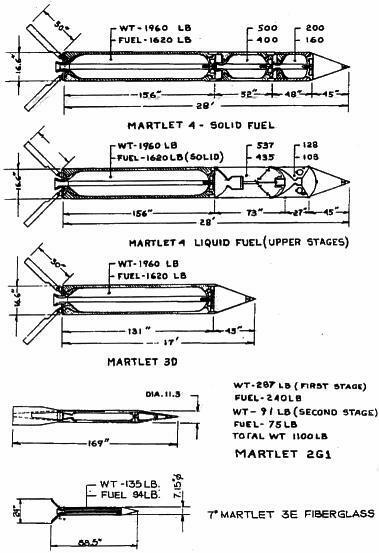 In the end the US Army would loose out to the Air Force for control of space operations and this ongoing political conflict would later prove a grave hindrance to the development of the Martlet 4 satellite launcher. Everything looking rosy and the early development of the HARP facilities was proceeding smoothly. However Bull's political enemies conspired to defeat HARP before it started. It began when the Department of Defence Production in Ottawa denied the $500,000 grant that they had verbally promised in the spring. The official reason given was that McGill was not an 'industrial concern'. Had a private corporation applied, the grant would have been given. Memos and innuendo began to fly around Ottawa claiming, among other things, that HARP would 'not open up any new possibilities whatsoever' or that it was no more then a publicity stunt. Even though it was admitted that the theories were sound, it was claimed that HARP would never work in practice. One of the chief opponents of HARP was a man named J.L. Orr, who at the time was the Industrial Research Advisor to the Ministry of Industry. Mr. Orr proved that he was adept at applying all of the subtle pettiness of the democratic bureaucracy to undermine the HARP program at every possible opportunity. By manipulating the personal opponents of Bull and belittling the accomplishments of the HARP project he was instrumental in denying Canada its first domestic satellite launching system. In March of 1962 Mordell and Bull held a press conference officially announcing the HARP project. The presentation included models of Bull's Martlets, named for the bird on the McGill University crest. The media was suitably impressed. The HARP project was not as nearly advanced as the press was led to believe. However the press conference had been held not just to introduce HARP to the world but also to force a continuing commitment by McGill's upper echelons. With the media's attention focused on it, and the support of the US Army, the HARP project developed a momentum of its own. McGill University found they had no easy way out of the $200,000 advanced loan. To belay criticism of the projects funding, McGill University announced that HARP would not be financed by the university itself but by 'contracts from governments and institutions desiring to utilize this unique research facility'. In practice this simply meant the US Army. 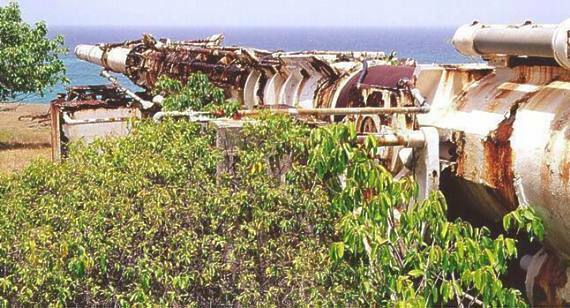 In April HARP began the process of installing the big 16-inch gun on the island Barbados. A gun pit was dug into the island's coral base. A concrete emplacement was pored so that the barrel could be elevated to vertical. By May the gun pit was ready and the big 16-inch gun was on its way to its new Caribbean home. As a further example of the US Army's enthusiasm for the HARP project, they conducted the largest peacetime, over-the-beach-landing operation in history. The 16-inch gun barrels and equipment were placed on flat bed rail cars and then loaded onto the tank landing ship the USS John D Page. The rough coastline at the range site did not allow the gun barrels to be landed adjacent to the range site. The Page had to land the barrels about 7 kilometers down the beach. From there they were transported to the gun site by laying a temporary railway track and tractoring the rail cars along. With only 450 meters of track available, sections of track were pulled up as soon as the loads had passed and relayed in front. Once at the site the gun mountings and yoke were installed on the concrete emplacement and the barrel was maneuvered into place. Installing the first barrel was a long and tiring process with workman and scientist alike pulling and straining to man oeuvre the 40-ton gun barrel into its final position. By the end of the summer of 1962 the gun was in place and the other facilities were nearing completion. Workshops, storage buildings, propellant magazines, telemetry and radar installations, and a multitude of other facilities were constructed. 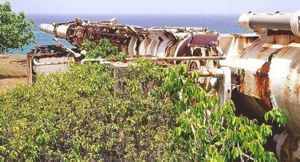 The Barbados launch site was beginning to take the form of a modern space launch complex. With the big 16-inch gun in position, and the launch site facilities in place, the real work of the HARP program was set to begin. It was a fluke of history that the Cuban Missile Crisis occurred before the hard-working crews of HARP could make their first test shot. The people of HARP, along with the rest of the world, held their collective breaths and waited to see if the world was once again going to war. This crisis could not have come at a worst time for HARP. It was obvious to anyone familiar with the instillation on Barbados that the gun system could in no way be used as a weapon against Cuba. But in the event of a war, the Cubans and the Soviets would surely consider it a danger. It would likely draw air strikes. Fortunately the crisis ended peacefully and war was once again adverted. In January the HARP team was back at Barbados and ready for their first test flights. An initial test series 12 launches was scheduled. It was hoped to break the current gun-launched altitude record of 70 km, set two years earlier by BRL. As with many start-up operations this first test series was plagued by equipment problems. These included a leaking recoil mechanism, which delayed the first flight by some six hours. On the twentieth of January 1963 the big gun roared for the first time as it fired its first test shot into the clear blue sky. This was the first time in history that a gun of this caliber had been fired at an angle of near vertical. From a cloud of flames and smoke a 315 kg test slug was hurtled into the air. With a launch velocity of 1000 m-s and a flight time of about 58 seconds the wooden slug rose to an altitude of 3000 meters before coming down a kilometer off shore. On 21 January the first Martlet 1 was launched. It flew for 145 seconds and achieved an altitude of 26 km. On 23 January a second test slug was flown. On 1 February a second Martlet 1 reached an altitude of 27 km. This was the first flight of a Martlet with a radio transmitter beacon that allowed the vehicle to be tracked throughout the flight. With these four successful flights the first test series ended. The next series of test flights was conducted in early April using the new Martlet 2. The Martlet 2 vehicles performed well and upper atmospheric research with the 16-inch gun began. By the end of June a new world's gun-launched altitude record of 92 km had been set with a Martlet 2 by the big 16-inch Barbados gun. Impressed by HARP initial results the US Army agreed to fund the project for $250,000 a year. By the end of the year some 20 Martlet 2 vehicles had been flown with altitudes of 80 km being regularly achieved. A great deal of atmospheric information was obtained. Of greater value was the information that was obtained on the internal ballistics of the 16-inch gun and the flight performance of the Martlet 2, Martlet 3A and 3B vehicles. 1964 opened with more Martlet 2 flights. Early in the program it became policy to conduct a launch series at the beginning of each year. This served several purposes. Primarily, it allowed multiple data sets to be obtained over a fixed site at a fixed time of the year. This made it possible to compare the progressive weather conditions over many years. It was also not lost on the HARP staff that Barbados was somewhat more pleasant in the month of January then up north in Canada. The Martlet 2 quickly become the workhorse of the program and proved itself by carrying many diverse payloads. 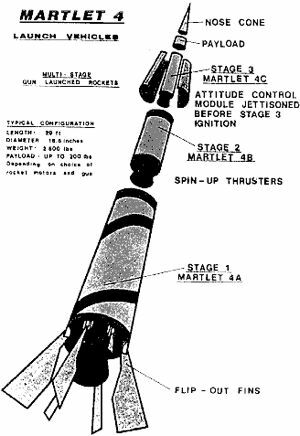 The Martlet 2's could be launched for a cost of about $3000 each at intervals of less then an hour. Over the length of the HARP program some 200 Martlet 2's would be launched, making it as one of the most successful sub-orbital vehicles ever developed. Impressed by the results of the HARP program, the US Army soon agreed to increase their annual finding from $250,000 to $1,500,000 per year. The Canadian government was still not funding HARP in any significant manner, but at least McGill was assured that their initial start-up loan was repaid. By March of 1964 the Canadian government had come to terms with the US Army. Joint funding of $3,000,000 per year was agreed upon. It was decided that the US Army's payments were to go through the Canadian government, which formally contracted McGill University to administer the program. But HARP's financing worries were far from over. McGill University was forced to once again fund HARP until the administrative concerns were addressed and the Canadian funding was available. Almost immediately HARP's opponents in Ottawa set to work to sabotage the operation again. The funding for the fiscal period of July 1964 to June 1965 was greatly delayed. The University advance the project some $500,000 to continue operations. The Canadian government did not release the projects funds, including the US Army's share, for some 10 months into the fiscal year. This was to be a pattern of bureaucratic sabotage that would plague the program to its end. A major factor that was to shape the future operations of HARP was that the US Army was loosing its battle to dominate space operations. As a result they were soon forbidden to conduct launches above 100 km. This resulted in restrictions in the HARP funding formula. Subsequently all funding for HARP's orbital program had to come from the Canadian portion of the funding only. Funding concerns slowed many of HARP's research and development programs. Even though they proceeded as smoothly as events permitted, many aspects of the project, including the orbital program, suffered unnecessarily. Much of the HARP research at this time was focused on fundamental research and development. Even though constrained, much was learned about the interactions of the HARP gun systems and their vehicles. One of the most significant events of the year was the opening of the Highwater test range. It was recognized early in the program that it would be advantageous to have a second launch site near McGill University where basic research could be conducted. Ideas could be then tested swiftly without the need to travel all the way to Barbados. A suitable site was found near the Canadian-US border, which just happened to be owned by Bull's extended family. The Highwater test range quickly became as important to HARP as the Barbados launch site and a second 16-inch gun system was installed. The Highwater gun was used for horizontal test flights only and could not be elevated higher then 10 degrees. The 16-inch horizontal gun range was some 1000 m long. It allowed new vehicles and systems to be tested under gun loads and in free flight while being monitored by a myriad of instruments. This range was also used for testing smaller gun systems and launch vehicles. The Highwater test site also had the distinction of being the only inland high altitude flight range in Canada. It was not long after the Highwater site opened that high altitude test flights with the 5-inch BRL guns began. These flights carried payloads to altitudes of over 70 km and focused on measuring upper atmospheric conditions. 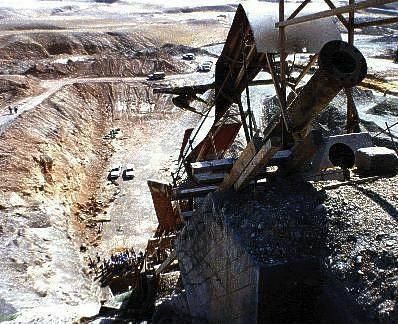 The workshops of the Highwater range became the project's primary construction facility. Experimental components and vehicles could be produced and tested at Highwater in short order. It is notable that the inconstancy of the HARP program's funding required a level of improvisation rarely seen in a world-class space program. Much of the credit for the project's technical achievements was due to the ingenuity and expertise of HARP's engineers and craftsmen. 1964 also saw the first attempts to improve the overall performance of the 16-inch gun system. The primary mechanical method selected to improve the performance of the 16-inch gun system was to lengthen the barrel. A few years earlier BRL had lengthened a standard military gun barrel by welding a second section of barrel to the muzzle of the first. Tests of this 5-inch gun demonstrated a higher muzzle velocity for a given vehicle. 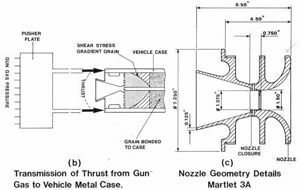 This was due to the simple fact that the longer barrel allowed the propellant gasses to push on the projectile for a longer time period of time, resulting in a higher velocity at muzzle exit. This resulted in a corresponding increase in the maximum altitude a given vehicle could achieve. This exact same concept was to be applied to the 16-inch gun on Barbados. The first attempt at extending the 16-inch gun was made in September of 1964 when a 10 calibers extension was added to the gun. To install this extension a flange was first welded onto the muzzle of the 16-inch gun barrel. Then a bracket was welded several feet down from the muzzle to allow for the attachment of stiffening bars. The barrel extension was equipped with its own flange and had a stiffening bar bracket about 2-3 the way up its length. The extension was installed by bolting the two flanges together and then attaching the stiffening bars to both brackets. The stiffening bars were adjustable to allow an accurate barrel alignment to be maintained. This technique proved itself with corresponding increases in velocity and altitude being recorded during test flights. It was not a surprise that this improvised extension did not last long. In December, on the eleventh test shot, the extension failed. Still this experiment proved that it was practical to extend a gun of this size. Plans were laid for a new extension that would nearly double the length of the 16-inch gun to 86 calibers, or an enormous 120 feet long. The year opened with the extension of the 16-inch Barbados gun. The first task was to enlarge the gun pit to accommodate the larger gun and its associate equipment. With this accomplished a permanent barrel extension, made by modifying a second 16-inch gun barrel, was welded onto the muzzle of the existing gun. At 120 feet long and nearly 100 tons it was recognized that without additional support the new gun had no hope of maintaining a precision bore alignment when elevated to vertical for firing. Some 25 tons of weldments were added to the two-barrel assembly to stiffen it. Eight adjustable drawbars were also installed so that the gun could be aligned at any angle of elevation. This extension made the 16-inch Barbados gun the largest operational artillery piece in the world at the time. In mid-1965 the HARP project was in full swing and the big 16-inch gun on Barbados was making regular firings. 5-inch and 7-inch HARP guns were conducting launches in places as diverse as Alaska, Wallops Island Virginia, Highwater, Quebec and Barbados. Progress on all technical programs was advancing significantly, despite funding problems. Volumes of scientific data were being collected from all aspects of the program. The new Highwater site was also progressing by leaps and bounds. The expansive 2000-acre site was becoming a major operational center for HARP with small gun firings occurring regularly. Throughout the year plans for installing a new 16-inch gun in Highwater were progressing smoothly. By November the gun was in place and test firings commenced soon after. This gun only fired horizontally with vehicles impacting into a mineshaft dug into a hill on the far side of the valley some 1000 meters down range. 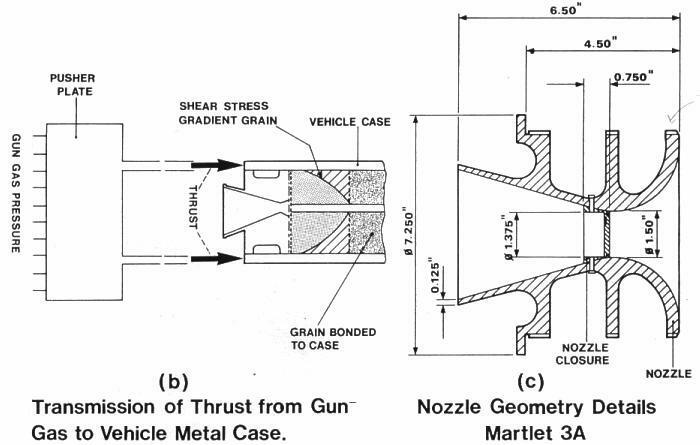 The Highwater gun was primarily used to test the performance of vehicles inside of the gun and in free flight during the critical muzzle exit and sabot separation phases. Nowhere in the world, at any time before or since, has there been such a massive gun based development program as this in private hands. The University of McGill reveled in the prestige of this world-class facility. Even with the great technical advances made by HARP in 1965 all was not well behind the scenes. Back in Ottawa the bureaucracy continued to snipe at HARP. The promised Canadian funding was again delayed for 10 months into the fiscal year. With McGill once again providing advances to HARP to maintain operations, development projects such as the Martlet 4 were delayed. Meanwhile the US Army was beginning to be drawn more and more into the conflict in Vietnam. The Army's attention, and their funding, was being diverted elsewhere. By the start of 1966 the enemies of the HARP Program were hard at work behind the scenes trying to sabotage it. Rumors indicated that the Canadian government was preparing to pull the plug on the program. J.L. Orr had sent a damning report to Ottawa unfairly criticizing the HARP project. He suggested that HARP's funding should be allocated to other programs. One of the true heroes of the HARP Project at the time was Donald Mordell. Gerry Bull gets most of the credit for the technical successes of HARP. But if it were not for Donald Mordell's extensive lobbying, the project would have succumbed to bureaucratic pressures far earlier. He mounted a constant defense of HARP in private, in government circles, and in the press. Much of the political goodwill that HARP received at the time was due to his diligent effort. Mordell's convinced many of the great potential of HARP and the project shared many supporters in the press and in public. One of the chief arguments of the media supporters of HARP was that its cancellation would once again default a major project's technology to the Americans. As with the Avro Arrow fighter, Canada would loose world class, home grown, technology. 1966 progressed as well as could be expected with high altitude launches proceeding throughout the first half of the year. However the bureaucratic strain on the HARP program was taking its toll. Programs such the Martlet 4 orbital vehicle suffered gravely, particularly when the project was forced to lay off important personnel in April due to funding delays. The turmoil on the Canadian side of the border did not escape HARP's American partners. In anticipation of future problems it was decided that a 16-inch gun site was needed on American soil. This would make the US involvement completely independent from the Canadian bureaucracy and McGill's Barbados launch site. The third and final 16-inch gun of the HARP program was installed at the Yuma proving grounds in Arizona. This gun was practically identical to the Barbados gun, although it did sport several improvements as a result of lessons learned during the construction of the Barbados gun system. Unfortunately the Yuma gun enjoyed only a short operational life with only a few launch series being conducted there. The Yuma Gun's sole claim to fame was that on November 18, 1966 it lofted a Martlet 2 vehicle to a world record altitude of 180 km, which still stands today. The extensive efforts by the HARP staff to defend the program from its critics were slowly overcome by the bureaucratic pressure being exerted against it. In November of 1966 the Canadian Government announced that there would be no further Canadian funding for the HARP Project after June 30, 1967. HARP's critics had demanded that the project's funding should be cancelled immediately. They railed against even this small extension. It was decided that HARP would be sacrificed. In its place the funding would go to the new Alouette satellite, the Fort Churchill, Manitoba, rocket range and the new Black Brant sounding rocket. These few extra months of life did not come without a price. As a last ditch effort to save the program a desperate and devious plan was hatched. In exchange for the few extra months of funding Gerry Bull personally guaranteed that by the end of June 1967 HARP would be financially self-sufficient and no longer require Canadian government assistance. Bull's guarantee was a long shot but it did solve problems in all quarters. Foremost this action took the responsibility for the potential failure of the program off the shoulders of the Canadian Government and placed it squarely on Gerry Bull. For this small reprieve the Canadian government could claim to have saved face. For the project it meant that big changes had to be made. Sub-orbital research flights did not provide enough income to finance a continuing project. It was necessary to orbit a satellite, any satellite no mater how small, to prove that it could be done and encourage further investment in the orbital programs. The Canadian decision had an immediate and unexpected effect on the US support of HARP as well. With the war in Vietnam raging and the Army's loss of space operations to the US Air Force, the Canadian bailout was used as an excuse by the Pentagon to order the US Army to pull out of HARP. So abrupt and unexpected was this decision that a series of test launches being conducted at Yuma were halted in the middle of the operation. There was no opportunity to even analyze the data that had already been collected! HARP was in a precarious situation. Without financial support the operations of the project quickly crumbled. All active research projects came to a screeching halt. The gun sites at Barbados and Highwater were effectively shut down. All but a caretaker staff had to be laid off. Determined to save the essence of the program Gerry Bull and a small group of engineers and technicians worked frantically to develop the one mechanism they believed would keep the dream alive - a satellite launch vehicle. Martlet 2G-1 vehicle. Orbital 2G-2 would have added a second stage. Martlet 3A in its sabot. Martlet 3B was similar. The original Martlet 4 design, with the sub-calibre first stage and ACM. Model of the Project Babylon gun.